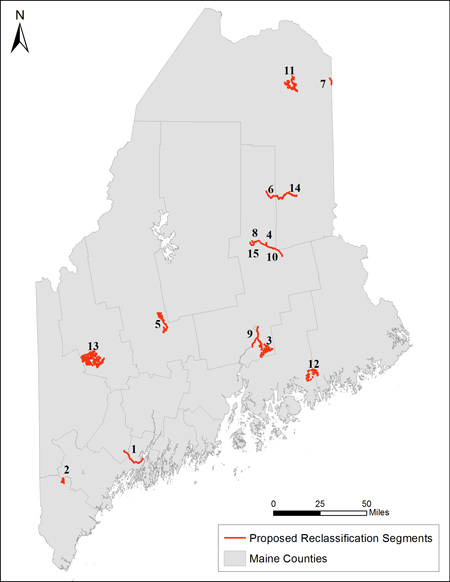 Maine’s Water Classification law is designed to protect, restore and maintain water quality. The law directs the implementation of water management actions for a water body or segment of a water body based on Maine’s classification system. Uses and criteria that apply to each waterbody type and water quality classification can be accessed on DEP’s Classification of Maine Waters web page. The re-classification of waters of the State is governed by 38 M.R.S. §§ 464(2), 464(2-A), 464(3)(B) and 464(4)(F)(4). This statute requires the Department of Environmental Protection to conduct water quality studies and the Board of Environmental Protection to hold hearings and, as appropriate, propose changes to the water classification system to the Legislature for final approval. This is to be conducted from time to time, but at least every three years. A comprehensive round of re-classifications in 2009 resulted in a number of changes to the water classification system; in 2011, one change was enacted. The Department solicited proposals for re-classifying waters in the fall of 2017. Submission guidelines including a timetable were included in the solicitation mailing. After review, the Department developed initial draft recommendations and obtained public comment. During the summer/fall 2018, the Board of Environmental Protection will conduct a public hearing and receive public comment before making recommendations on re-classifications to the Legislature, which makes final classification determinations for the State. The U. S. Environmental Protection Agency must ultimately give final approval to any changes made by the State of Maine. The Department received proposals from stakeholders and also developed its own proposals; Figure 1 shows all waters that were proposed for changes. (1) Upgrade to Class B: Androscoggin River from Durham Boat Launch or Worumbo Dam, to the mouth of the Androscoggin in Merrymeeting Bay at a line between Pleasant Pt., Topsham and North Bath (Lisbon, Durham, Topsham, Brunswick). (7) Upgrade to Class B: Limestone Stream below Long Road (Limestone, Fort Fairfield). (3) Upgrade to Class A: Blackman Stream and tributaries (Clifton, Dedham, Holden, Eddington, Bradley). (6) Upgrade to Class A: Fish Stream (Mount Chase, Patten, Crystal, Island Falls). (9) Amendment to statutory language: establish new boundaries for segment of the lower Penobscot River (Milford, Old Town, Bradley, Orono, Eddington and Veazie) with a ‘free-flowing habitat’ designation. (10) Upgrade to Class B: Penobscot River from the confluence of East and West Branch to the confluence with Mattawamkeag River (Medway, Molunkus TWP, Woodville, Mattawamkeag). (11) Upgrade to Class A: Salmon Brook and tributaries (Westmanland, T14 R5 WELS, Perham, Wade). (9) Establish new boundaries for segment of the lower Penobscot River (Milford, Old Town, Bradley, Orono, Eddington and Veazie) with a ‘free-flowing habitat’ designation. (15) Upgrade to Class B: West Branch Penobscot River from the outlet Quakish Lake to its confluence with the East Branch Penobscot River (Millinocket, T3 Indian Purchase TWP, East Millinocket, TA R7 WELS, Medway). (2) Upgrade to Class A: Back Brook and tributaries (Limington). (5) Upgrade to Class A: East Branch Wesserunsett Stream and tributaries (Mayfield, Brighton Plantation, Athens). (8) Upgrade to Class B: Millinocket Stream from the confluence of the West Branch Canal to the confluence with West Branch Penobscot River (Millinocket). (12) Upgrade to Class A: Tunk Stream and tributaries, upstream of Route 1 in Steuben (T10 SD, Sullivan, T7 SD BPP, Cherryfield). (13) Upgrade to Class A: Webb Lake Tributaries (Weld, Township 6 North of Weld, Philips, Avon, Temple, Perkins TWP, Carthage, Roxbury). (14) Upgrade to Class A: West Branch Mattawamkeag River from I-95 to the confluence with Mattawamkeag Lake (Island Falls). The Department reviewed all proposals that were submitted by considering a number of factors, including water quality standards attainment status, data availability and interpretation, impact on licensed dischargers and hydropower facilities, landuse in the watershed, presence of conservation land, value of waterbody as endangered species habitat (Atlantic salmon), and classification of adjacent water bodies. Where appropriate, Department staff also ran water quality models to inform the decision-making process. Documentation containing the Department’s initial recommendations on all proposals, i.e. those recommended for action by DEP and those not recommended for action, is available here. The Department conducted the public input phase on its initial recommendations on re-classification proposals from April 20 to June 5, 2018. Two public meetings were held during this period, on May 22 in Augusta at the DEP Response Services Building and on May 24 in Millinocket at the offices of the Baxter Park Authority. The presentation from the public meetings is available. The Department accepted written comments until June 5, 2018. Responses to Comments are available. The Board of Environmental Protection (BEP) conducted its public input phase between August and December 2018. The Department presented revised recommendations (following initial public input) to the BEP at the regular meeting on July 19, 2018 in Augusta and requested that the BEP schedule a public hearing. The Board granted the request and the public hearing on these recommendations occurred on September 20, 2018 in Bangor. The public comment phase on the recommendations extended from August 1 through October 9, 2018. The transcript from the public hearing and comments submitted at the hearing as well as collated comments received are available. A work session between the Department and Board on recommendations as revised following the BEP's public input phase occurred on November 1, 2018. Following this meeting, the Department developed its final recommendations and responses to comments received during the public comment phase. At its regular meeting on December 6, 2018, the Board voted unanimously to send the final recommendations to the Legislature for its consideration in the next Legislative session. Information on the legislative phase of the re-classification initiative will be added to this page when available. Questions regarding the current re-classification initiative may be directed to Susanne Meidel.